This article is about the fortune telling object. For other uses, see Crystal ball (disambiguation). The Crystal Ball by John William Waterhouse. 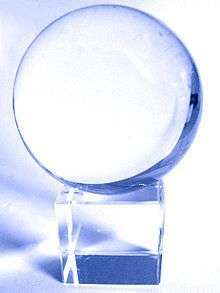 A crystal ball, also known as an orbuculum, is a crystal or glass ball and common fortune telling object. [lower-alpha 1] It is generally associated with the performance of clairvoyance and scrying in particular. In the 1st century AD, Pliny the Elder describes use of crystal balls by soothsayers ("crystallum orbis", later written in Medieval Latin by scribes as orbuculum). By the 5th century AD, scrying was widespread within the Roman Empire and was condemned by the early medieval Christian Church as heretical. Dr. John Dee was a noted British mathematician, astronomer, astrologer, geographer, and consultant to Queen Elizabeth I. He devoted much of his life to alchemy, divination, and Hermetic philosophy, of which the use of crystal balls was often included. Crystal gazing was a popular pastime in the Victorian era, and was claimed to work best when the Sun is at its northernmost declination. Immediately before the appearance of a vision, the ball was said to mist up from within. Crystal balls are popular props used in mentalism acts by stage magicians. Such routines, in which the performer answers audience questions by means of various ruses, are known as crystal gazing acts. One of the most famous performers of the 20th century, Claude Alexander, was often billed as "Alexander the Crystal Seer". A transparent sphere of any material with refractive index greater than one brings parallel rays of light to a rough focus (that is, a focus with significant coma). For typical values of the refractive index, this focus is usually very near the surface of the sphere, on the side diametrically opposite to where the rays entered. If the refractive index is greater than 2, the focus is inside the sphere, so the brightest accessible point is on its surface directly opposite the source of light. However, few materials have that property. For most materials, the focus is slightly outside the sphere. The closer the refractive index is to 2, the closer the focus is to the surface of the sphere, and hence the brighter the spot formed on an object touching the sphere. This effect is used in the Campbell–Stokes recorder to record the brightness of sunlight by burning the surface of a piece of cardboard placed near the sphere. The same effect can occur with a crystal ball that is brought into full sunlight; it may either burn a hand that is holding it, or even start a fire if it is resting on or very near dark-coloured flammable material. A crystal ball lies in the Royal Sceptre of Scotland that is said to have been originally possessed by pagan druids. Philadelphia's University of Pennsylvania Museum of Archaeology and Anthropology displays the third largest crystal ball as the central object in its Chinese Rotunda. Weighing 55 pounds, the sphere is made of quartz crystal from Burma and was shaped through years of constant rotation in a semi-cylindrical container filled with emery, garnet powder, and water. The ornamental treasure was purportedly made for the Empress Dowager Cixi (1835-1908) during the Qing dynasty in the 19th century, but no evidence as to its actual origins exists. In 1988, the crystal ball and an ancient Egyptian statuette, which depicted the god Osiris were stolen from the Penn Museum, but were recovered three years later with no damage done to either object. ↑ Sometimes further referred to as a shew stone (or show stone – "shew" is an archaic spelling of "show"). 1 2 Sibyl Ferguson (30 June 2005). Crystal Ball: Stones, Amulets, And Talismans For Power, Protection, and Prophecy. Weiser Books. pp. 59–60, 29. ISBN 978-1-57863-348-7. 1 2 "Crystal gazing". Encyclopædia Britannica. Retrieved 6 November 2015. ↑ Chauran, Alexandra. Crystal Ball Reading for Beginners: A Down To Earth Guide. Woodbury, Minnesota: Llewellyn Publications, 2011. ↑ Associated Press (29 January 2004). "Crystal Ball Starts Fire at Okla. Home". The Washington Post. Retrieved 22 December 2012. ↑ "Crystal Sphere". University of Pennsylvania Museum of Archaeology and Anthropology. Retrieved 21 September 2014. ↑ "Statue". University of Pennsylvania Museum of Archaeology and Anthropology. Retrieved 21 September 2014. ↑ "Penn Museum Crystal Ball, Statue Stolen Guard Ignored Burglar Alarms". Philly.com. Retrieved 21 September 2014. Andrew Lang, Crystal visions, savage and civilised, The Making of Religion, Chapter V, Longmans, Green, and C°, London, New York and Bombay, 1900, pp. 83–104.